2018 is quite special for me and I am grateful that blogging-wise, it started on a good note. 2018 marks my 10th year in food blogging. YedyLicious is 10 years old! Time flies so fast. The KTG Bloggers annual party I have attended early this month reminded me that I am lucky to have met really wonderful people, and to be part of an awesome family of bloggers in my 10 years of blogging. So, while it may seem that this blog is gathering dust for couple of months now with occasional posts here and there, God willing, it will pick up from here on. For now, there is a lot to talk about as the title suggests. If you are new here and not really familiar with our family we fondly call The KTG, previous write up here and here may serve as a bit of an introduction. You may also join us on our Facebook group and see happy delicious chaos we create as a group of hungry kids. 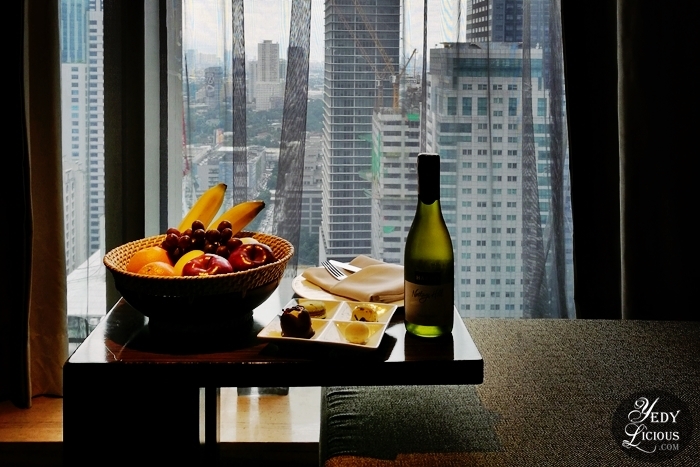 Marco Polo Ortigas Manila is one of the hotels located at Ortigas Central Business District. It is surrounded with different shopping malls, restaurants, and other food establishments that hotel guests may visit and explore if so desired. If on the other hand the guests would rather stay within the hotel property but still want to enjoy an excellent gastronomical experience, Marco Polo Ortigas Manila wouldn't disappoint. 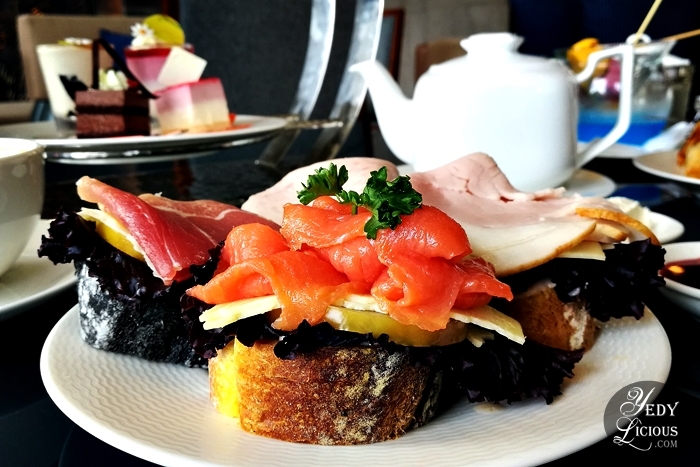 I have mentioned on the first part of my Marco Polo Hotel Staycation series that Marco Polo Ortigas Manila houses specialty dining outlets that caters even to the most discerning palates. During my staycation, I had the pleasure of visiting and trying out these dining options inside Marco Polo Ortigas. While I have dines at some of these restaurants in the past, everything still leaves good impression and memorable experience for me. After an unforgiving work schedule for the past months, I had the pleasure of staying at Marco Polo Hotel Ortigas Manila recently for a well-deserved relaxation. Now I am telling you this from the get-go, my stay at Marco Polo Manila is one of the best hotel staycations I have had recently. The stay coincided with my birthday which makes it all the more special. Good quality service and impeccable experience are to be expected when staying at a five star hotel, I know. 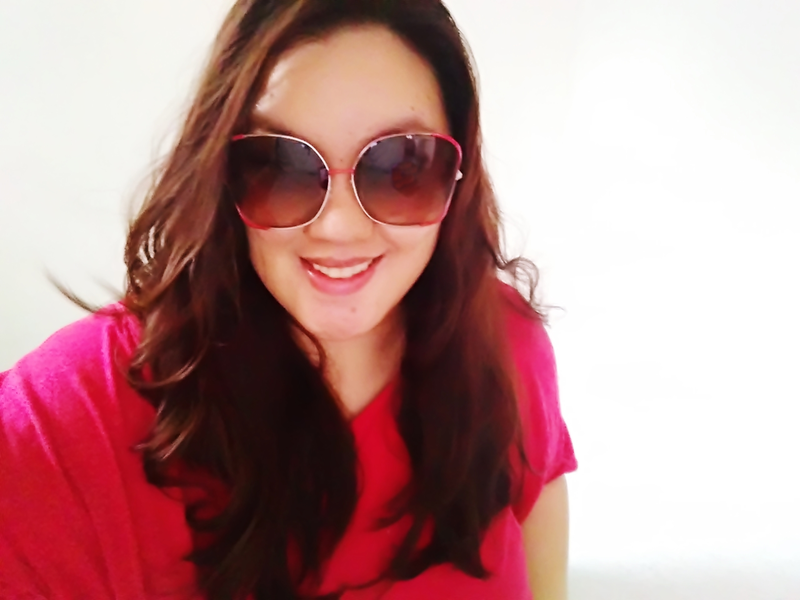 However, Marco Polo Hotel Ortigas Manila exceeded that expectation which made this girl right here, really happy. No wonder that since Marco Polo Hotel opened its door here in Manila, it already got several recognition under its umbrella. For one, Forbes Travel Guide, known as the global authority on luxury travel since 1958, awarded Marco Polo Hotel Ortigas Manila as one of the finest five star hotel in the world for 2017. Impressive, right? 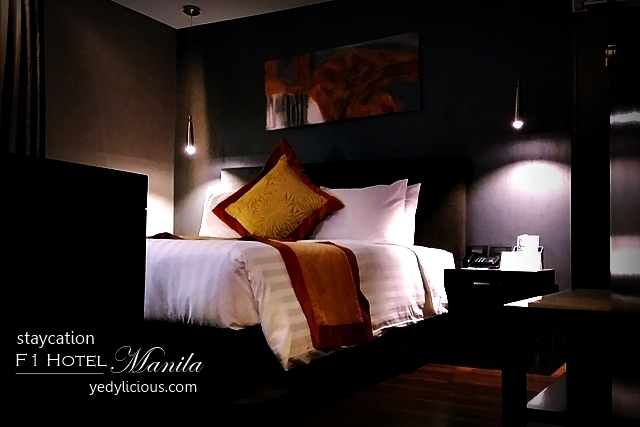 I have been to decent number of hotel staycations with my KTG Manila bloggers family and the recent one which I deem really enjoyable and memorable was our stay at Makati Diamond Residences. 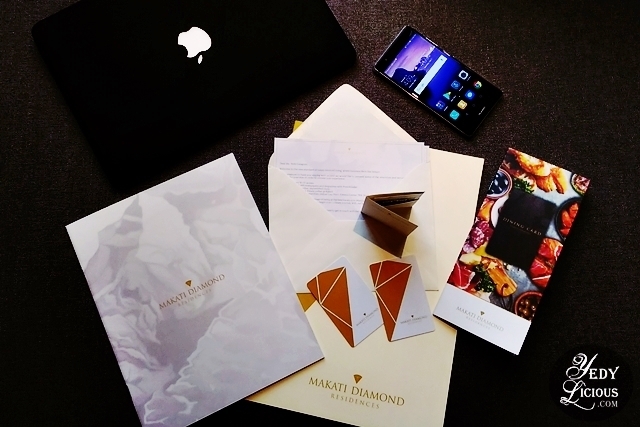 A luxurious serviced apartment in the heart of Makati Central Bssiness District, Makati Diamond Residences is part of San Miguel Properties Inc.
Now I say that when asked for recommendation on good place to stay in Makati area, I would certainly highly recommend Makati Diamond Residences. Heaven knows how I love that place. Everything was just perfect during our stay. The place, the company, and of course the food - those glorious food! I wish I have blogged about this soon, but corrupted memory card means months of waiting before you could retrieved lost files. So now, here I am. There are a lot of hotels near Ninoy Aquino International Airport and with the newly completed NAIA Expressway, travelers can expect to set foot at the City of Dreams Manila which houses impressive hotel properties, within approximately five minutes. With that good news, I figured it was the best time to have a staycation at Hyatt Hotel at City of Dreams Manila with some friends who just came from South Korea. The convenience of really short travel time from picking them up at the airport to arriving at Hyatt COD was impressive. But then of course, its proximity to the airport is not the only thing that makes Hyatt the best option for a satisfying hotel stay when in Manila. There are plenty of other reasons which make Hyatt, City of Dreams Manila your next best hotel destination. 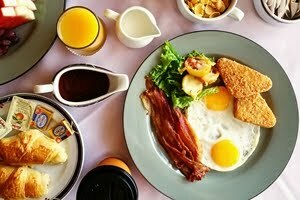 There are many things to be loved about The Nest, the in-house restaurant of Vivere Hotel Alabang. While there are many which I acknowledge, there are few that for me, really stood out. That, I learned during my recent stay at Vivere Hotel one weekend. The Nest is aptly followed by the tag "Dining in the Sky" because with the view from the 31st floor of the property that comes with the dining experience, it is indeed like dining in the sky. Indeed the view is great, but it is not exactly the thing that blew me away, no sir. It is not exactly the reason why I would want to go back. During my recent stay at Vivere Hotel in Alabang, I was able to take a peek of the hotel amenities as well as the other suites of the property. Since it was a weekend, Vivere Hotel is fully booked as there are some events happening but I was lucky that there were some rooms which haven't occupied yet at the time of my viewing. Great hotel amenities is one of the vital things most of us consider when choosing a hotel. After all, it is always comforting to know that whatever you may need during your R&R will be well provided. Being a five-star hotel, it is only expected that Vivere Hotel will do well in this league. Based on experience, I could say that they did not disappoint. I however is curious what does the other suites at Vivere Hotel may look like, and I am thankful that such request was granted. Before you read on, you might want to check the first part of my Stay at Vivere Hotel Alabang blog post series which can be found here. Vivere Hotel and Resorts Alabang is one of the oldest five star hotels in Alabang area that boasts of a grand 31-storey building which houses 200 elegant suites. Tagged as the gen of the Southern part of Metro Manila, it is said to be one of the best places to be when one is traveling for business or for recreational pursuits. I was hosted by Vivere Hotel one weekend to check out what their property can offer. Their timely invite couldn't be more apt as I am currently scouting for best hotels in Manila for some business clients who will be flying in from the US and Zurich. As with most of my Hotel Stay / Staycation Blog Feature, this one about Vivere Hotel in Alabang is a series of three blog posts (Read: Part One, Part Two, Part Three) Meanwhile, let us start with the first part - the room I have stayed in. I have stayed at F1 Hotel Manila for a number of times already - some with our KTG group for blogger staycation, some with my family for bonding times, and some with my friends for those nights when everyone rendered themselves useless manning the wheels after party at BGC area. 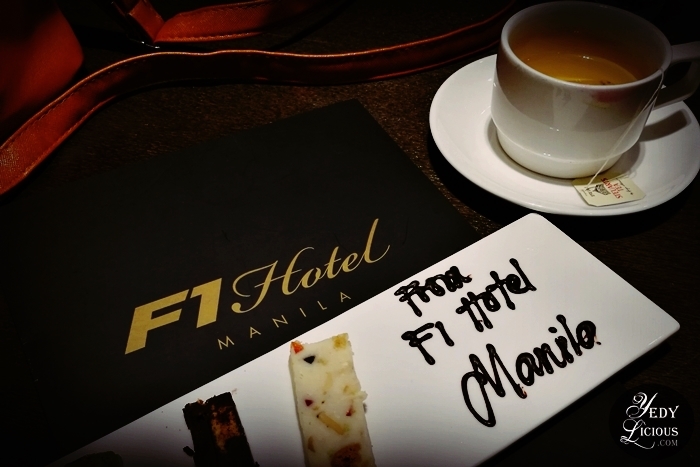 With those stays I must say that F1 Hotel Manila is really a Home of Happy Experiences. In line with their 4th Anniversary, F1 Hotel Manila is currently having an Anniversary Gift Certificate Sale Promo. The promo is only up until April 15 and we are talking about up to 60% discount for hotel stay and dining, so be sure not to miss this chance. And to let you see how awesome staying and dining at F1 Hotel Manila is, I am sharing with you the account of our recent staycation at F1 Hotel Manila with my KTG Family. As with all staycation blog posts here at YedyLicious, this one is photo heavy and a it personal, so read when you have ample free time and towards the end of this post, details about the Anniversary Sale promo will be included. It was supposed to be just a random road trip, this drive to Tagaytay City. Then in a blink of an eye, I found our group scouting for place like a headless chicken where we could spend the night. Warm bed after a nice shower isn't a bad idea so no one opposed. The thing is, it was a holiday - all hotels we could think of were fully booked. There's really nothing much to write about Tagaytay Haven Hotel save for the fact that it saved us from spending the night in the car like homeless runaway kids and that it is probably one of the most affordable hotels in Tagaytay. But nope, no glaring review here, no rants either. It just served its purpose during our stay, no more no less. The second day of our stay at Taal Vista Hotel Tagaytay was all about feasting on the amazing breakfast/brunch buffet at Taza Fresh Table Restaurant, checking out all the other things that Taal Vista Hotel has to offer, and basically enjoying the rest of our stay. We are scheduled to check out and head back to Manila at around noon so make sure to make use of the remaining time we had for relaxation and enjoyment - two of the things anyone who wished to stay at Taal Vista Hotel can actually experience amidst the beautiful view and fine weather. The previous night was one hell of a crazy bonding with our group that we didn't noticed we were already a couple of hours away from the dawn. Not that I am complaining because it was one of the best night spent with friends I had for what seems like a long time. It was a treasured moment, I must say. 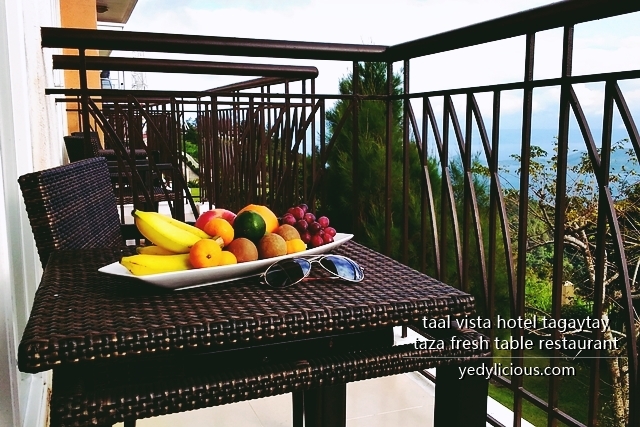 Our recent stay at Taal Vista Hotel in Tagaytay to check out and have a food trip at Taza Fresh Table Restaurant I must say is one of the most enjoyable Tagaytay trips I have ever had as of yet. One of the best staycations I had in my blogging years. Although it was a quick overnight stay, the fun, enjoyment, and relaxation - I appreciate to the core. While it helps that I was with some of my KTG Family, we could all say that the main reason for our grand time in Tagaytay City was the accommodation at Taal Vista Hotel and the kind service they provided us. A lot has been said about Taal Vista Hotel. About how great of a hotel it is, about its historical past, and about how enjoyable it is to stay with them. Now it is high time for me to share here on the blog how I enjoyed my stay at Taal Vista Hotel with some friends. So, we have arrived at the last part of my Staycation at Oakwood Premier Manila Blog Series. The last day of my stay at Oakwood was as nice as the first day having the Jazzy Sunday Brunch Buffet as its highlight. Bonus part was that I spent it with some of my favorite Manila food bloggers which I consider my family in this industry. I admit that I had a great time recalling that weekend at Oakwood to weave stories to share with you. Although I do not have all the time in the world to finish writing everything in one sitting, I am glad that you have stayed with me. Good memories are not meant to be rushed, only savored. Thank you for your patience. It tickles me to the bone that some of you sent me emails and messages through my Facebook page just to let me know that you are enjoying this mini series. Do not worry, I am working on making the comment system here at YedyLicious way easier to deal with. Meanwhile, you are always welcome to get in touch with me by any means we see fit. On the first part of my Staycation at Oakwood Premier Manila in Ortigas blog post series, I let you in on a little tour of the One-Bedroom Deluxe which I have stayed in. I apologize if it took me a while to post this second part because well, life outside the cyberspace skyrocketed from being downright chill to notoriously demanding. But I am done complaining. I stole some time to make way finishing the second installment of this mini blog series. So, where was I? Yes, right. We're done with the tour. Now, on to the back story. Morning of Saturday that I am scheduled to check in at Oakwood, I was at some photo shoot to finish the project I committed myself into. To say that I was exasperated even before the clock hits 12 would be an understatement. On my way to Oakwood, I grabbed a sandwich and commenced what was the first meal of my day while walking and running carrying one overnight bag and another one full of equipment. I met up with my mother so that they could drop me off at Oakwood. One of the things I love doing for my blog aside from dining at restaurants is writing about hotel staycations here in Manila. So, when this month was welcomed with a weekend staycation at Oakwood Premier Manila in Ortigas, I know I have to make time even if it entails moving mountain. It is my birth month after all, I figured I could use a break from the usual. Having experienced several themed buffets at Oakwood Premier Manila's Oakroom Restaurant, I have always been confident that they are well worth sharing here on my blog. I even hosted couple of giveaways out of Oakwood's generosity and belief that great food are meant to be shared. This time though, what I am sharing is my weekend staycation experience at Oakwood. If you have been a long time reader, you know how enthusiastic I can get especially when it comes to telling some great experiences about my little adventures. Add to that the fact that I can get trigger happy when exposed to lovely surroundings with pleasant ambiance. Disclaimer though, as with most of the things I have shared here on YedyLicious, this is not a review, I am just sharing my stories with you. Yes, this is going to be a long post with lots of photos and I deem it is only apt to divide it into parts. And this first part right here is what I call, "A Little Tour of My Room at Oakwood." I still have loads of restaurant blog posts to write about but I figured the best way to start the month is to show gratitude. The weekend staycation we had at B Hotel Alabang and Bellevue Manila was by far one of the best weekends I had with some of my blogger friends. All thanks to the generous and kindly people of Bellevue Hotels and Resorts and of course, to Jane Go and Family. Now if you've read my staycation series (first day, second day, third day), you would know that it was also made all the more sweet with the generous people behind different brands that shared with us their products. And with that, I am truly grateful. These sponsors kindly showed us their generosities and provided some of their products while we were having our Alabang staycation. Some of them I am already familiar with, while the others I was just introduced to during that time. Please mind however that this is not a blog post for product reviews, rather, this is a gratitude blog post. I was under the impression that the third day of our hotel staycation and food tripping at B Hotel Alabang and Bellevue Manila will be way "lighter" in terms of food consumption compared to the past two days. The first day was a beautiful prelude to the weekend that was, and filled with a lot of food and thoughtful accommodation from the people behind Bellevue Hotels and Resorts, the second day was equally epic. The third day was all about eating while waiting to eat yet again. We only got few things on our itenerary since we are scheduled for a check out on the third day. But it doesn't mean that we went easy on the eating spree. Who could blame me really? We were given an impressive accommodation and impeccable service at B Hotel, such experience calls for celebration. Our second day of hotel staycation at B Hotel in Alabang started with a breakfast buffet spread completely devoid of bacon. My cousin Euge was already giving me an evil stare while contemplating on literally dragging me to the nearest establishment that could give him his daily bacon fix. I feared for my life at some point. Those stares were gut wrenching, I tell you. Good thing though that despite the bacon’s illuminating absence on the buffet spread of B Hotel’s Prime Café, it can be had. While I was being glared at with an evil stare, I was already fumbling through my phone in an attempt to contact my ever reliable friend, The Pickiest Eater, the bacon aficionado himself to save us from an impending doom of bacon-less world when another good friend Abet of The Food Alphabet came in to the rescue. 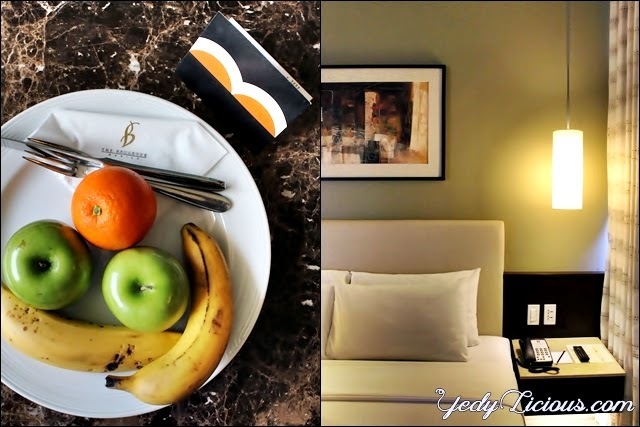 The news about a weekend hotel staycation at B Hotel and Bellevue Hotel Manila both located in Alabang, Muntinlupa came in a form of an enthusiastic email from one of my blogger friends Jane of Sugar and Spice blog. I just came from a week of meatless diet and I was dead set on slowly introducing my system to meat again. Slowly was the operative word. But then the Universe had another plan. Jane’s email held a promise of fun and food-filled weekend with some of Manila Food Bloggers I consider my friends. While the entire itinerary presented to us was downright enticing, I was on a fence. Mainly because I feared that three days of non-stop eating would screw up my system big time after having had the meatless diet the previous week. Good thing though that my good friend Pickiest Eater’s unwavering enthusiasm was and is always contagious. Also, Jane’s undeniably entertaining email of an invite was too charming to reciprocate with regrets. Hence, I fired an en email to Jane with a big yes. Best decision, I must say. We are a group of more than 10 bloggers. Due to the season when hotels are mostly booked for the upcoming holidays, half of our group was assigned to stay at Bellevue Manila while the other half was assigned to B Hotel, the Bellevue Manila’s sister hotel. I was part of the group who was assigned to B Hotel and while I have not yet experienced a staycation in a “business hotel” (save for one overnight stay at some 3-star hotel wherein I was assigned to write a feature about their renovation) and was a bit apprehensive about it, I was confident that given the company I will be joining, not to mention the exciting itinerary, I knew that it will be an epic weekend staycation. And it was.